Soon after announcing the new Mulsanne range, Bentley has unveiled the Mulsanne Grand Limousine at the ongoing 2016 Geneva Motor Show. The vehicle now gets lengthier by one metre and gets a new higher roof that provides added space and comfort for occupants. This limousine has been hand-crafted in Crewe by Mulliner, Bentley’s coachbuilding division. The car boasts features like luxurious private-aviation-inspired rear cabin with face-to-face seating and smart glass’ assured privacy. 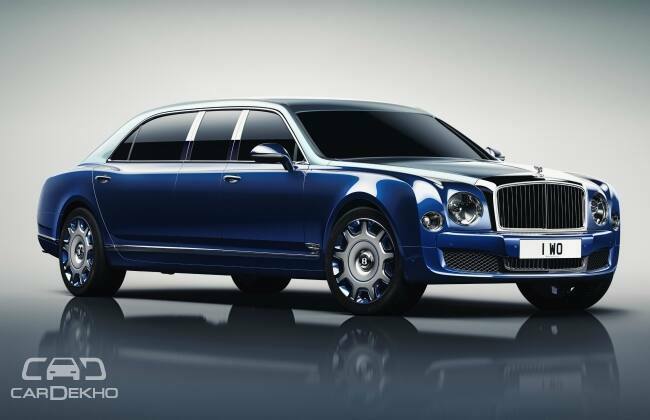 The Mulsanne Grand Limousine is one metre longer and 79mm taller than Bentley’s new Mulsanne. It boasts Bentley’s first application of electrochromic or ‘smart glass’, which allows passengers to switch the interior division and rear-cabin window glass between clear and opaque. With the focus on the rear-cabin, a new HVAC system has been developed exclusively for this car. Also, the car offers features such as iPad charging and docking stations, as well as veneered fold-out tables, a bottle cooler with frosted glass and crystal flutes, and a soft drink cabinet with bespoke tumblers. It has an intercom system to communicate with the driver and unique controls for the rear features. The car is available in a two-tone paint scheme - Silver Frost and Moroccan Blue. The Flying ‘B’ mascot has been engraved with the words ‘Coachbuilt by Mulliner’. Also, the car stands above a unique iteration of Bentley’s iconic chrome grille and lower bumper grilles, designed specifically for this car. This limousine runs on custom 21” wheels which are colour-matched to the exterior finish. In accordance with the stretched dimensions, the Mulsanne Grand Limousine by Mulliner is fitted with a fully engineered powertrain, transmission and a re-engineered chassis and suspension, guaranteeing the highest possible degree of passenger comfort and safety in the longest ultra-luxury sedan in the world.